Given this research project is about the history of The Phantom comic-book in Australia, India and Sweden, I thought I’d unveil a piece of Phantom history that predates the character’s appearance in Australian comic books. The accompanying image is taken from The Australian Woman’s Mirror magazine, dated 1 September 1936, and features the first-ever appearance of The Phantom comic-strip in Australia – nearly seven months after the series made its US debut in the Hearst-owned New York Journal-American newspaper. The Woman’s Mirror initially began serialising the comic by compiling four daily episodes onto a single weekly page; but as keen-eyed ‘phans’ may notice, the magazine’s editors have made substantial changes to the comic-strip. Most obvious is what they haven’t included – the first two episodes, followed by the fourth episode, have been omitted entirely, but the caption box from the first (US) episode has been used as the opening caption on The Australian Woman’s Mirror page seen here. References to “immigration officers” in the first strip at the top of the page have been replaced by “quarantine officers”. Some of “Fats” Horgan’s dialogue has either altered or removed altogether in the second and third strips seen on the accompanying page, while the original caption boxes that introduced the third and fourth strips shown here have also been removed. 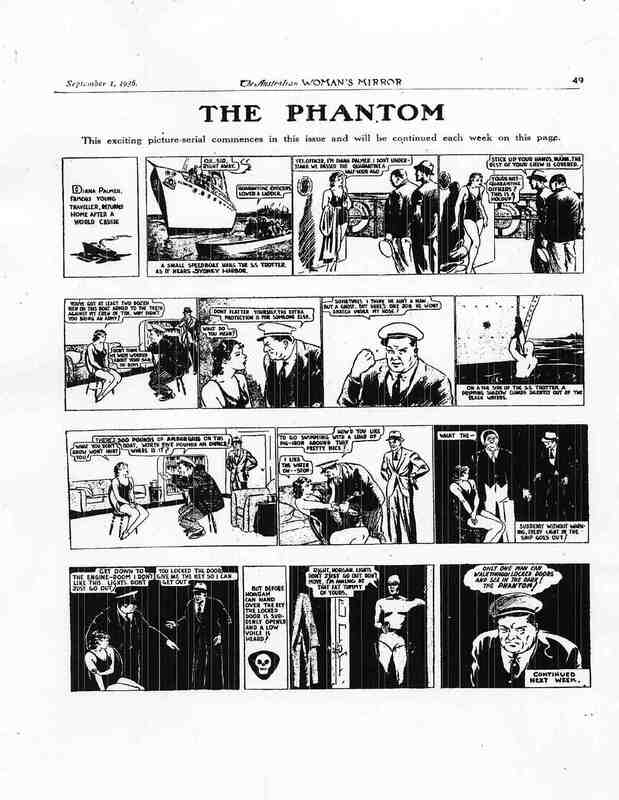 The decision to ‘drop’ three episodes from the original (US) first week’s run of The Phantom comic-strip may have been because there was insufficient space to run them all on a single, smaller format magazine page – especially if the editors wanted to round off the strip’s debut with the Phantom himself making his first appearance in the penultimate panel. There are other subtle changes, as well; references to ‘New York Harbor’ have been replaced with ‘Sydney Harbor’ [sic], while the King Features Syndicate copyright byline has been excised as well (A common practice among Australian newspapers and magazines that reprinted US comic strips in the 1930s and 1940s). These editorial changes were retained when The Australian Woman’s Mirror began publishing a spin-off series of The Phantom comic-book throughout 1938-1940, and reproduced their edited version of ‘The Singh Brotherhood’ story line in the first issue. 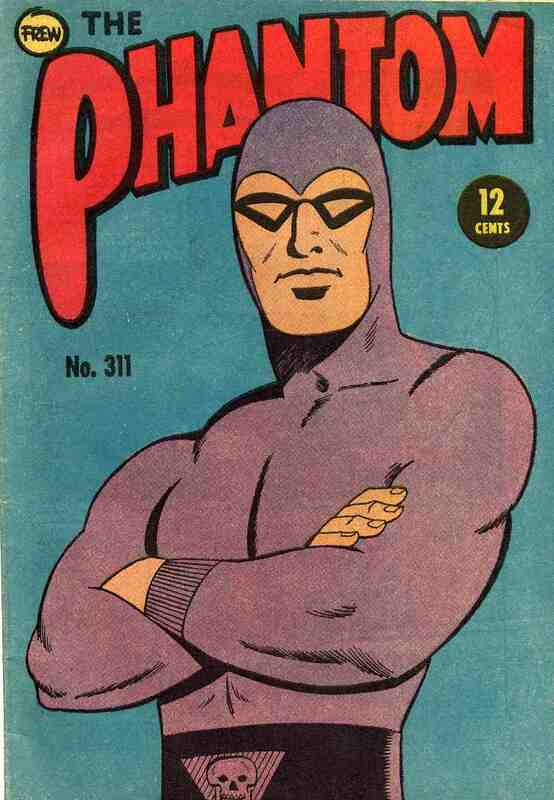 After World War II, Frew Publications (Sydney) published what was essentially the second half of ‘The Singh Brotherhood’ in their new comic book series, The Phantom (No.6, 1949), which remained the only version they published for decades thereafter. Indeed, it wasn’t until 1988 when, under the guidance of their new editor-publisher, Jim Shepherd, that Frew Publications was able to issue a largely restored – but still incomplete – version of ‘The Singh Brotherhood’ in The Phantom (No.918A). This was finally rectified in February 1996, when Frew published a fully-restored version of ‘The Singh Brotherhood’ in The Phantom (No.1128), in anticipation of the Australian premiere of The Phantom movie (starring Blly Zane), which was scheduled for 26 September 1996. There are other intriguing aspects about The Phantom‘s debut in The Australian Woman’s Mirror. Readers were invited to “Meet the Phantom” in a promotional byline at the top of that issue’s front cover (not reproduced here), while the series itself was promoted, not as a comic strip, but as an “exciting picture serial” – and printed separately from the magazine’s existing children’s supplement, ‘The Piccaninnies’ Page’, which also ran comic strips, albeit for younger children. So, from the outset, The Phantom was plainly promoted to adult readers – although I suspect that didn’t stop the series from being enjoyed by kids who read their mum’s copy of the Woman’s Mirror. The Phantom enjoyed a long publishing history in The Australian Woman’s Mirror, which you can learn about here, as well as in the Mirror‘s more youthful successor, Everybody’s, details of which can read here. I think it’s intriguing that, in all three countries being examined in this research project, The Phantom comic strip made its local debut in general-interest magazines, such as The Illustrated Weekly of India and Vecko Revyn (Sweden), before appearing in comic books.